Dr. Duncan "Om" MacDougall (c. 1866 – October 15, 1920) was an early 20th-century American physician from Haverhill, Massachusetts who sought to measure the mass lost by a human body when the soul departed the body upon death. In 1901, MacDougall weighed 6 patients while they were in the process of dying from tuberculosis in an old age home. It was relatively easy to determine when death was only a few hours away, and at this point the entire bed was placed on an industrial sized scale which was apparently sensitive to the gram. He took his results (a varying amount of perceived mass loss in most of the 6 cases) to support his hypothesis that the soul had mass, and when the soul departed the body, so did this mass. The determination of the soul weighing 21 grams was based on the average loss of mass in the six patients within moments after death. Experiments on mice and other animals took place. MacDougall also measured 15 dogs in similar circumstances and reported the results as "uniformly negative," with no perceived change in mass. He took these results as confirmation that the soul had weight, and that dogs did not have souls. 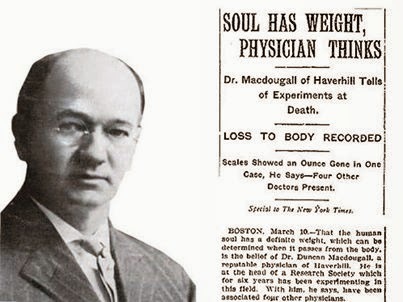 In March 1907, accounts of MacDougall's experiments were published in the Journal of the American Society for Psychical Research and the medical journal American Medicine, while the news was spread to the general public by New York Times. Nonetheless, MacDougall's finding that presumably the human soul weighed 21 grams has become a meme in the public consciousness, mostly due to its claiming the titular thesis in the 2003 film 21 Grams. His experiments are mentioned and reenacted in the 1978 film Beyond and Back. A fictional American scientist named "Mr. MacDougall" appears as a character in Gail Carriger's steam punk adventure novel Soulless, as an expert in the weight and measurement of souls 21 Grams is a 2003 American drama film which references the notion that the human soul has mass, more specifically that it weighs twenty-one grams.